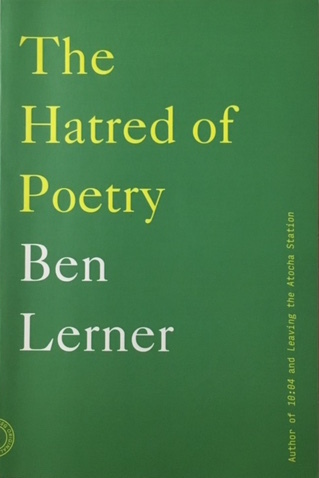 Ben Lerner's The Hatred of Poetry is an interesting book with a catchy title. It is a conundrum book, too, not by title alone but because of what Lerner is tackling as a poet and as a critical thinker/essayist. angle, it's the fact that most of us don't read poetry any more. And yet ... Bob Dylan's recent Nobel Prize is proof that while we don't read poetry so much, we do listen to it. Who would argue that Dylan is not a poet? Few could disagree that his poetry put to song also reads wonderfully on the page: the words sing however you lay them down – on paper or on musical notes. But what happened to printed Poetry (yes, with a capital P) that it should languish so terribly in our time? Was it captured and imprisoned by the universities? Was it destroyed in countless high schools across the land? Was it killed by the Testing Bureaus? Or is it just that Plato started the whole thing, the hating of poetry, because he believed it would corrupt and mislead the youth of his time? case in this clever little book of his. And he covers a lot of sacred ground. Genuine poetry, he contends, creates a place for possibility. He ends his book length essay with the fact "it might come to resemble love." Those of us who love poetry, and always have, might smile at this, for poetry – and here I am speaking for myself – IS love. The act of writing it, seeing it written, and feeling it within is the very essence of being in love with life. Thanks, Ben. Nizalowski sings of crickets in the deep grass, sirens, fires, crimes, suicides and a "freight train rumble receding into/the long Colorado desert night." Whatever he touches upon and it is mostly a matter of myth and travelogue, vision and music, he does so elegantly, simply elegantly. Few have written as wisely about the desert and its hold on those who personally let go within the empty heart of that landscape. Where the sand ends, the music begins. Where the music begins the whirling sand is pure poetry. a regular contributor to Stay Thirsty Magazine.